The Partnership for a Healthier America, which works with the private sector and Michelle Obama to make healthier choices easier, announced its Healthier Campus Initiative today in New Orleans at the American Public Health Association’s annual conference. UCLA is one of 20 colleges and universities that are part of the program, which will reach more than 500,000 students and 126,000 faculty and staff. UCLA is the only postsecondary institution in California that is participating. According to the organization’s CEO, UCLA was one of the important inspirations for the program. 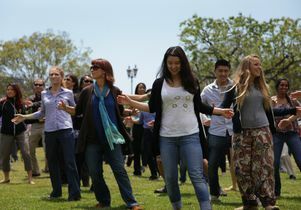 “The Healthier Campus Initiative was born out of a collaboration between the Partnership for a Healthier America and the nation’s leading nutrition, physical activity and campus wellness experts, including leaders at UCLA,” said Lawrence Soler. UCLA’s Healthy Campus Initiative is a campuswide effort that draws upon the campus’s world-renowned research and teaching to find new and innovative ways to promote healthy living at UCLA and share that education and research with other communities. Each of the participating universities has pledged to adopt guidelines for food and nutrition, physical activity and programming over the next three years. “The PHA agreement gives us an opportunity to help evaluate our progress toward our goals,” said Dr. Wendy Slusser, associate vice provost for the HCI and a clinical professor at the David Geffen School of Medicine at UCLA and the UCLA Fielding School of Public Health. “It will also introduce us to other university leaders across the U.S. and enhance our learning of best practices and our ability to leverage resources to promote health and wellness on our campuses and in our communities.”? Slusser attended the announcement joined by UCLA colleagues and philanthropist Jane Semel, who with her husband, Terry Semel, envisioned and supported UCLA’s Healthy Campus Initiative. PHA’s Healthier Campus Initiative comprises 23 guidelines, many of which UCLA has already implemented as part of its campus mandate. Others were new initiatives prompted by PHA discussions. Among them are offering a minimum of one “wellness meal,” which meets nutritional guidelines set by PHA, at each mealtime; offering a minimum of five types of fruits, five types of vegetables and two 100 percent whole grain products at both lunch and dinner; and implementing a program at dining venues to encourage healthier food consumption. UCLA has also moved to add more local and sustainable food as part of its commitment to the PHA program. Currently, UCLA serves 17 percent locally sourced food in its dining operations; the campus’s goal is to achieve 20 percent by 2020. The focus on healthy, sustainable food at UCLA is in line with the University of California Global Food Initiative, which was also shaped in part by leaders of UCLA’s HCI. The systemwide initiative was introduced by UC President Janet Napolitano in July at an event held at UCLA’s student-run community garden.